James E. Hansen (b.1941) is Director, Program on Climate Science, Awareness, and Solutions, at Columbia University’s Earth Institute. He served as head of NASA’s Goddard Institute for Space Studies, a unit of the Earth Institute, from 1981 to 2013. 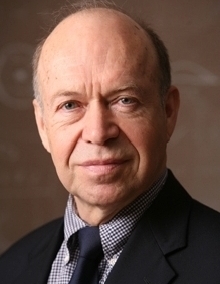 Hansen is best known for his 1988 testimony to the US Congress on global warming underway, and subsequent advocacy for widespread action, summarized in a 2012 TED Talk, “Why I must Speak Out About Climate Change.” He is the author of Storms of My Grandchildren: The Truth About the Coming Climate Catastrophe… (2009), many scientific articles such as “Can We Defuse the Global Warming Time Bomb?” (Natural Science, 2003), and Op-Eds such as “OK, US Government: See You in Court” (Boston Globe, 2017). He has received many awards and honors, e.g. : the highest honor bestowed by the American Meteorological Society for his climate modeling, the Heinz Award in 2001, Time magazine’s 100 Most Influential People in 2006, and Foreign Policy’s Top 100 Global Thinkers in 2012.